A few days after installing my new Netgear WNR3500L router, I noticed two problems with DD-WRT build 13527 (documented here). In summary, I found that DD-WRT reboots every 20-90 minutes under heavy 802.11n traffic on the WNR3500L. Rather than waste days or weeks experimenting with different builds of DD-WRT, I decided to fix several problems at once by adding a second wireless access point (AP). By placing a dedicated 802.11n AP upstairs, wireless coverage would improve, the WNR3500L would (in theory) stop randomly rebooting, and my 802.11g devices would no longer create throughput bottlenecks. 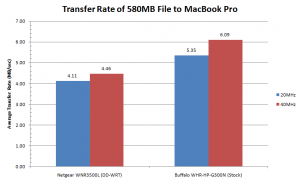 On paper, the WHR-HP-G300N is nothing special. Featuring single-band, dual-antenna 2.4GHz output powered by a 400MHz Atheros AR7240 radio, paired with only 32MB RAM and 4MB flash, and a 100MB/sec switch, the WHR-HP-G300N is outdone by most other 802.11n routers on the market. The Asus RT-N16, for instance, offers a faster processor with 4x the RAM and 8x the flash capacity of the WHR-HP-G300N. Buffalo has also forgone extras, such as USB ports, which are found on more expensive routers. However, the WHR-HP-G300N makes up for its limited feature-set with its low price tag and High Power output (hence, the “HP” portion of its model number). 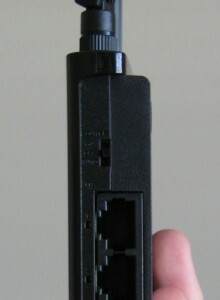 Not only has Buffalo given the WHR-HP-G300N two external, adjustable (and replaceable) antennae, but all HP models utilize internal RF amplifiers on the receiving and transmitted ends of the radio. Therefore, I expected nothing less than excellent signal quality from the WHR-HP-G300N. The WHR-HP-G300N also supports DD-WRT. 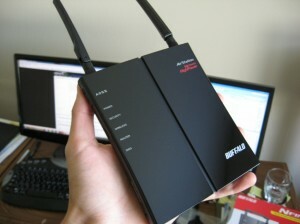 In fact, Buffalo offers their own “official” DD-WRT build, which is included on CD with the router. Like most shiny electronics, the WHR-HP-G300N shipped with a layer of plastic film to protect its super glossy black finish. The router itself feels solid, however, the buttons, antennae, and base stand feel somewhat cheap—but at this price point, I can’t complain. 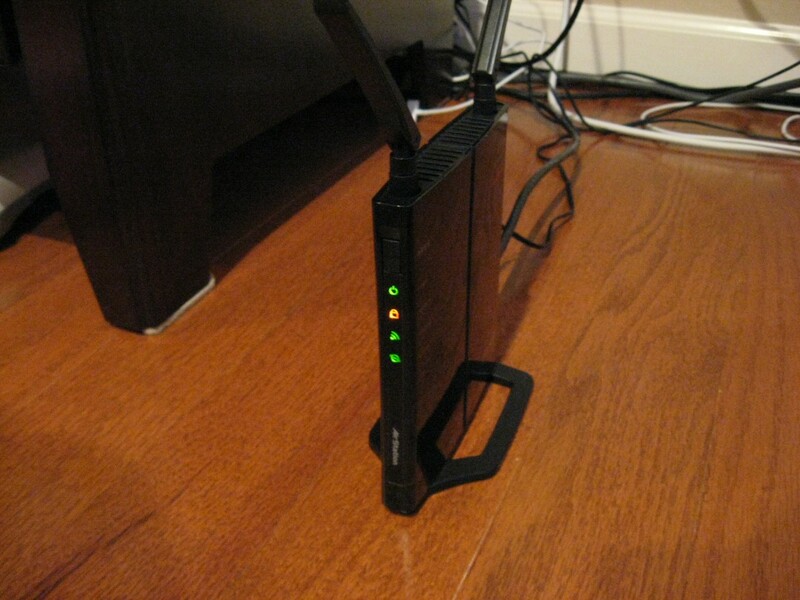 The green/amber status LEDs are less clever than the WNR3500L’s multi-color LED’s, but are clearly labeled on the side of the router. A switch on the backside jumped out at me, which read, “Router: ON, OFF, AUTO”. I hadn’t noticed this feature prior to purchase, but was pleasantly surprised to see it there since it meant less work for me (no need for DD-WRT to create an access point). I initially changed the switch from its default “Auto” position to “Off”, since I would be using the WHR-HP-G300N purely as an 802.11n access point. But, I quickly discovered that this setting makes it impossible to access the router’s configuration page. 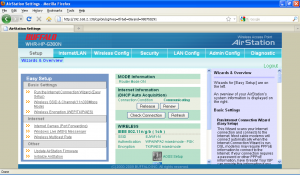 The router is still able to act as an AP in “Auto” mode, but in this mode, it also fetches an IP address for itself from the primary router/DHCP server on the network, thus, making its configuration page accessible. Buffalo’s factory firmware is surprisingly feature-filled (even packing a VPN server!) considering the router’s low cost. 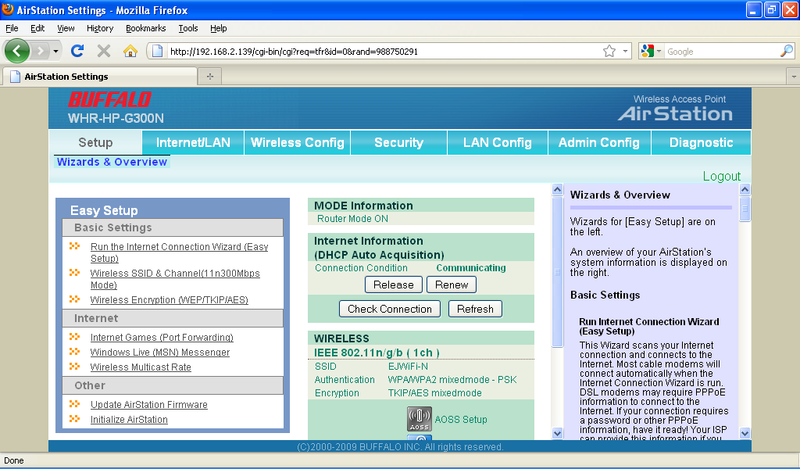 Maybe it’s due to years of familiarity, but I still find DD-WRT easier to navigate and configure. 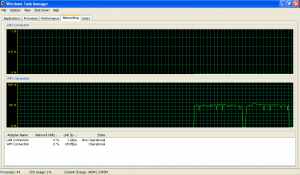 Buffalo’s firmware omits the advanced monitoring features found in DD-WRT, such as client SNR readings, bandwidth usage, wireless connection rates, etc. The WHR-HP-G300N’s stock firmware was set to Channel 1 during 20Mhz tests and Channels 1 + 5 during 40Mhz tests. Before taking any measurements, I observed the WHR-HP-G300N’s general wireless transfer stability on my netbook (the 65Mbps Link Speed is due to the default 20MHz configuration). File transfer times to our MacBook Pro improved by roughly 10% with the WHR-HP-G300N, and by over 30% to our Asus Netbook (nearly 1 minute saved for a 580MB file!). 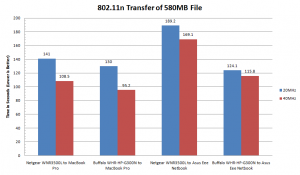 Below are the same measurements converted to average transfer rates. 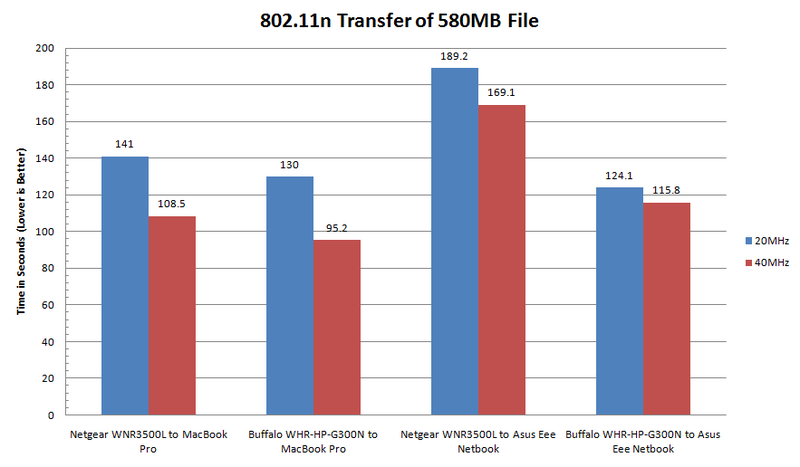 The MacBook Pro’s dual-antenna 802.11n radio achieves a transfer rate increase of approximately +30% at 20Mhz and +36% at 40Mhz over the Netgear WNR3500L, while the Asus Eee PC’s musters a +12% boost at 20Mhz and +7% at 40Mhz. Average figures for all routers were calculated from benchmarks results from both laptops. This isn’t a very accurate picture since the Eee PC employs a fairly slow 802.11n radio. Peak figures are the maximum rates observed during benchmarking. 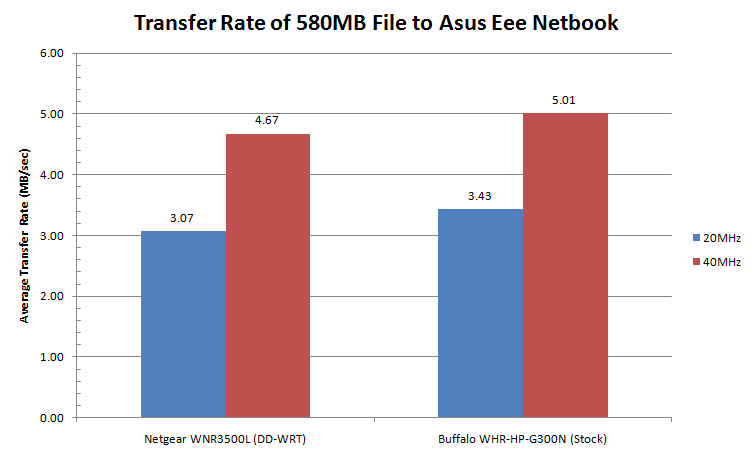 The graph fails to convey that the Buffalo WHR-HP-G300N frequently operates at or near the recorded peak transfer rate, whereas the Netgear WNR3500L generally fluctuates near its average rate. The above test results are real-world findings made on my home network. Clearly, the benchmarks are an unfair comparison since the WNR3500L was benchmarked on DD-WRT firmware and the WHR-HP-G300N was tested on stock firmware. Ignoring this injustice, the WHR-HP-G300N has increased my wirelsss-N throughput by roughly 30% in most cases. 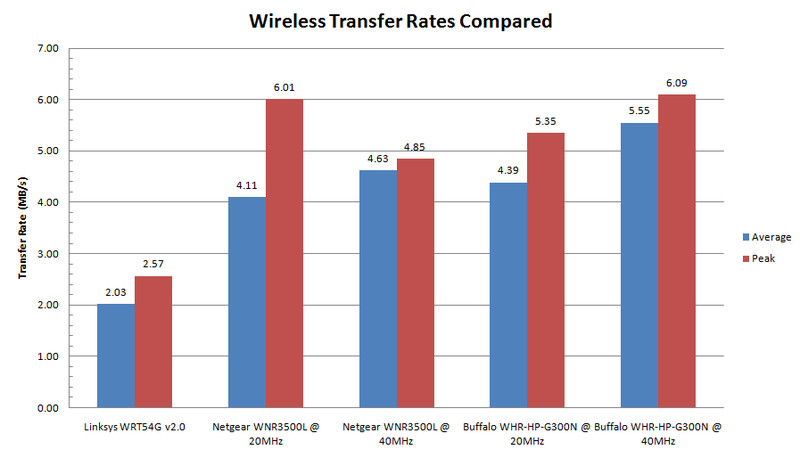 Buffalo’s stock firmware prevents me from reporting SNR’s, but wireless coverage also seems to have improved. And once again, the maximum 802.11n transfer rate observed of 6.09MBps (48.7Mb/sec) remains significantly below the WHR-HP-G300N’s 100Mb/sec switch speed. Wired, or wireless bridging? 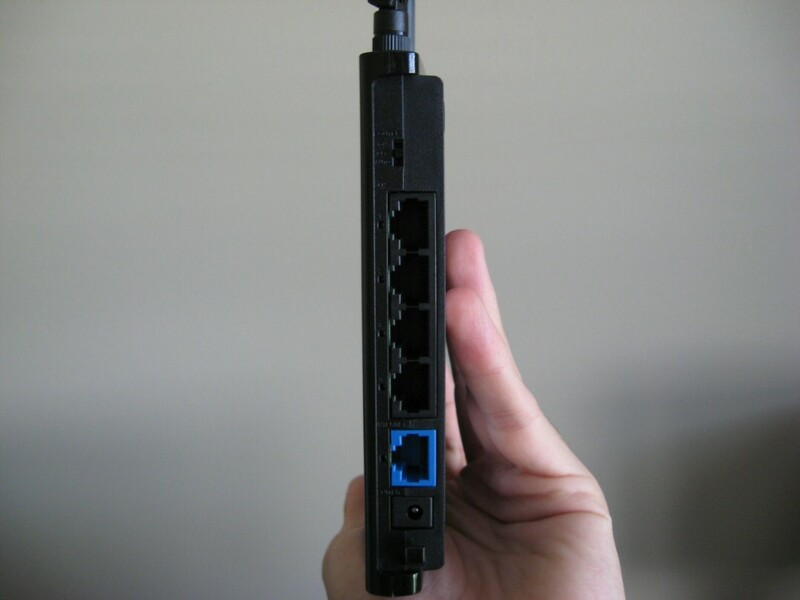 If wired, setup the first unit as a router, then connect the other five AP’s via CAT 5/5e/6 to the first router and set their switches set to “Auto” or “Off”. If you wish to bridge six access points wirelessly, I think you’ll need DD-WRT. Their support forum will be most helpful to you. I appreciated your review. I’m looking for wireless equipment that can link two buildings together. The info you provided will help me make my decision. If I may be so bold; I do have one correction for you. You switched the throughput numbers. Instead of 6.09Mbps (48.7MB/sec), I believe it should be 48.7Mbps (6.09MB/sec). Actually the manual (pdf document) indicates that the device’s IP address changes from 192.168.11.1 to 192.168.11.100 when you flip the switch ont eh back from auto to off. Nice review. I’m thinking of purchasing the Buffalo to replace the same Netgear 3500L because I’m not impressed with the wireless performance of the Netgear (stock firmware). 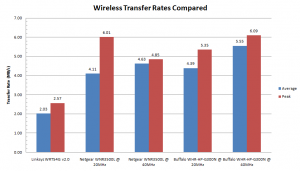 Did you ever put DD-WRT on the Buffalo, and if so, how was the wireless performance? Thanks. No, I haven’t tried DD-WRT on the WHR-HP-G300N, but I had a WHR-G300N in my hands for about a day. It took well to DD-WRT and has been running solid since December. That family member doesn’t use WiFi, though, so I can only attest to its wired routing reliability. P-660W-TX model zyxell kablosuz modemim ile buffalo whr-hp-g300n ile aralar?nda kablo ba?lant?s? olmadan bridge köprü görevi kurabilir miyim? DD-WRT rocks. The first thing I do when I or someone I know buys a WRT54G(L) is flash the lsasett version in. I have one, my parents have one, my in parents-in-law have one, my brother-in-law has one, we have 2 in the head office and 1 in each of 5 branch offices all running DD-WRT. I’m even giving one to my boss for his mother’s house. I also have 2 more sitting around waiting to be put to use.About the coolest thing I ever did with DD-WRT was set up one on an ethernet line in a hotel conference center, use the PPTP client to connect to the VPN at work. 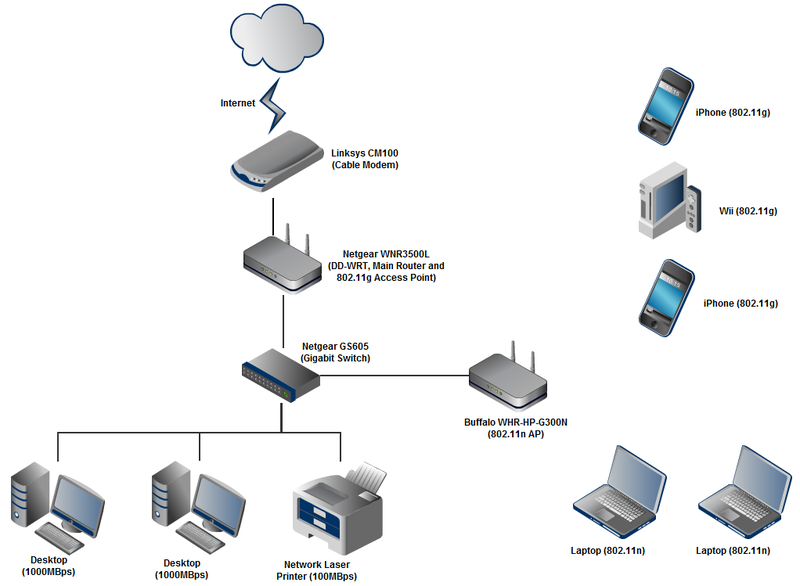 I then used 2 more as wireless _clients_ to the one on the VPN and connected 2 WYSE thin clients to each router and configured them to automatically login and auto-start IE to our Outlook Web Access. Our users could just enter their name and password to check their email between break-out sessions. I didn’t have to run a single network cable longer than the 3 feet from the router to the thin client, and the users didn’t have to worry about signing on the VPN, just sit-and-go. is it possible to replace the antenna of WHR-HP-G300N with Linksys 54G v5. actually i have a dead linksys and don’t know how to use it, secondly do u have any idea is WHR-HP-G300N can support tomato firmware??? Nice review. I do have a couple of questions though: Do you think the Buffalo WHR-HP-G300N would be preferable to the Netlink WNR3500L, as the network main router on a 3-store house? I make no use of Gigabit LAN (only 1 ethernet device, limited to 100 Mpbs), and unfortunatly can’t place the router near to the wireless devices (they are around 15~20 meters away), so it seems to me I would make better use of a stronger Wi-fi signal.